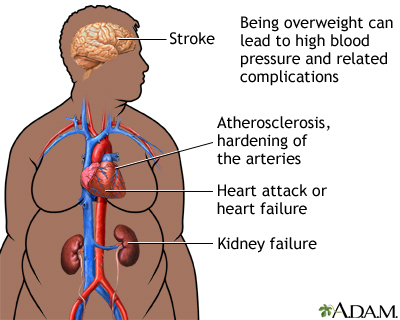 Obesity is a medical condition in which a high amount of body fat increases the chance of developing medical problems. High blood glucose (sugar) or diabetes. High blood cholesterol and triglycerides (dyslipidemia, or high blood fats). Heart attacks due to coronary heart disease, heart failure, and stroke. Bone and joint problems, more weight puts pressure on the bones and joints. This can lead to osteoarthritis, a disease that causes joint pain and stiffness. Stopping breathing during sleep (sleep apnea). This can cause daytime fatigue or sleepiness, poor attention, and problems at work. Body mass index (BMI) is calculated using height and weight. It is used to estimate body fat. Women with a waist size greater than 35 inches (89 centimeters) and men with a waist size greater than 40 inches (102 centimeters) have an increased risk for heart disease and type 2 diabetes. People with "apple-shaped" bodies (waist is bigger than the hips) also have an increased risk for these conditions. Having a risk factor doesn't mean that you will get the disease. But it does increase the chance that you will. Some risk factors, like age, race, or family history can't be changed. The more risk factors you have, the more likely it is that you will develop the disease or health problem. You can control many of these risk factors by changing your lifestyle. If you have obesity, your health care provider can help you begin a weight-loss program. A starting goal of losing 5% to 10% of your current weight will reduce your risk of developing obesity-related diseases.